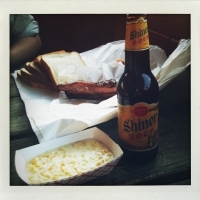 Until I got to Texas I’d never eaten ribs. I don’t really like eating meat that’s on a bone, so it’s not something I went out of my way to find. 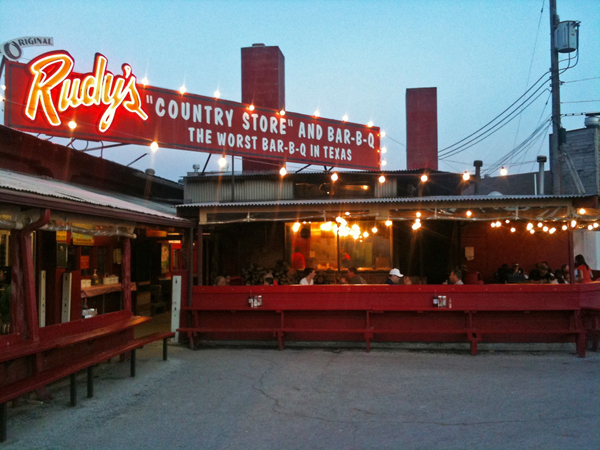 Barbeque is pretty hard to escape in Texas though, so after we’d sampled the chuckwagon version at Stillwell’s, we tried Rudy’s in San Antonio. Rudy’s is a chain, and oddly some of the locations have a gas station attached. We went to the original location in Leon Springs, just west of San Antonio. (Where I should add that the houses are huge, proper Texas gigantic and possibly either based on Caesar’s Palace, or St Peter’s in Rome.) 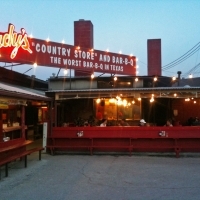 The original Rudy’s had a gas station attached, so that’s why they based some of the later offshoots on the original building. It seats about 100 people inside, and has patio seating as well. We got a half chicken, some ribs, the famous creamed corn, a peach cobbler, 2 bottles of Shiner, some beans and what was probably half a loaf of bread. (were we supposed to say when?) All of it was delicious, even the creamed corn, though it wasn’t something Paul would normally eat, and even the cobbler was top notch. The chicken was insanely tender. I regret not getting another half chicken to go. And also another cobbler. Not a fan of the bbq sauce, it was a bit thin. There were about 2000 bags of white bread behind the counter to service the insatiable need for something to sop up the bbq sauce.